Even though I cook a lot at home, I started to feel that I was only satisfying part of my foodie nature. Cooking at home is my option when a number of friends don’t materialize that want to go out to eat on a regular basis. So while I can whip up nice, fun, gourmet, easy and/or lightning fast meals at home, I miss being served! Via some twitter conversations, I got the inspiration to revive the “foodie project” — last year I thought I might do a collection of cheesecakes, but to be quite honest, I’m a plain cheesecake boy, no toppings, no fuss. My sweet potato cheesecake notwithstanding, I really don’t truck with all this fancy pants cheesecakery. Chronicling a few plain cheesecakes a month doesn’t seem very interesting. After a bit more thinking and chatting, it hit me–BRUNCH! My little scribblings on my dining out seem to draw enough friends, at least, that ask me for recommendations. I know of places to go eat brunch, but generally I don’t go to a lot of them. I’m much more likely to get up early, go on my own to breakfast and get on with my day. That’s out of both circumstance and necessity as many of my friends aren’t awake for a pre-noon brunch and if I wait til 1 or so to eat, I’ll have to snack first and ruin it. Yesterday, however, fortune shone on me as James was up and willing to get out into the gorgeous weather so we headed to Chef Geoff’s Downtown. It was a good start since I’d been there many times for lunch and dinner and Restaurant Week and I knew the food was good, even if they have started trending more and more upscale since opening. Must be DC does that to places, or that they’re near the theaters. Brunch for them is a fixed price affair with sides and cocktails also available. $25 gets you coffee along with a glass of juice, a mimosa or bloody mary, a starter and an entree*. [menu] When I completed my mimosa, it wasn’t a free refill, so no bottomless anything here. 👿 The “starter” was a small cup of fruit and “sweet bread” which mostly resembled coffee cake. I ordered the Senator’s Steak, James ordered the Downtown French Toast and I added on a side of the Very Gouda Grits. 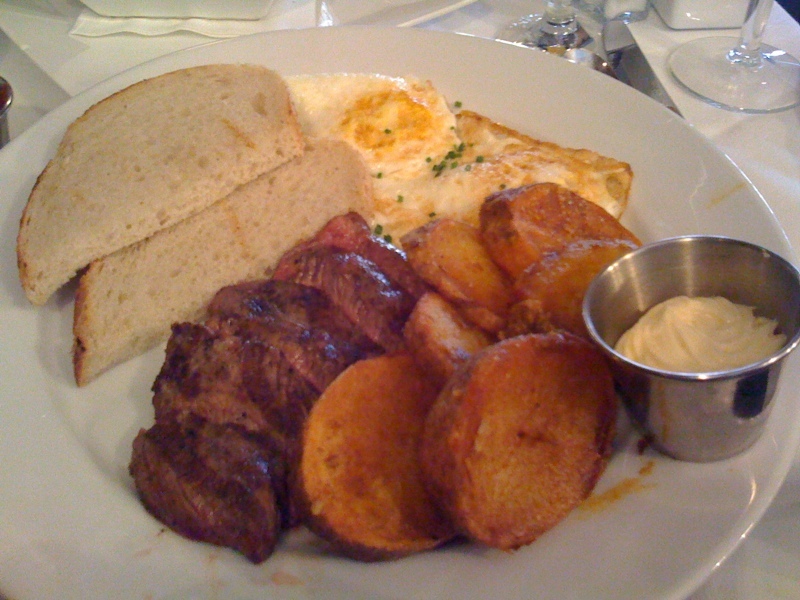 My steak and eggs were quite good, cooked to order, though the homefries were a little thick and over fried. On another day they might be perfect, but not so yesterday. 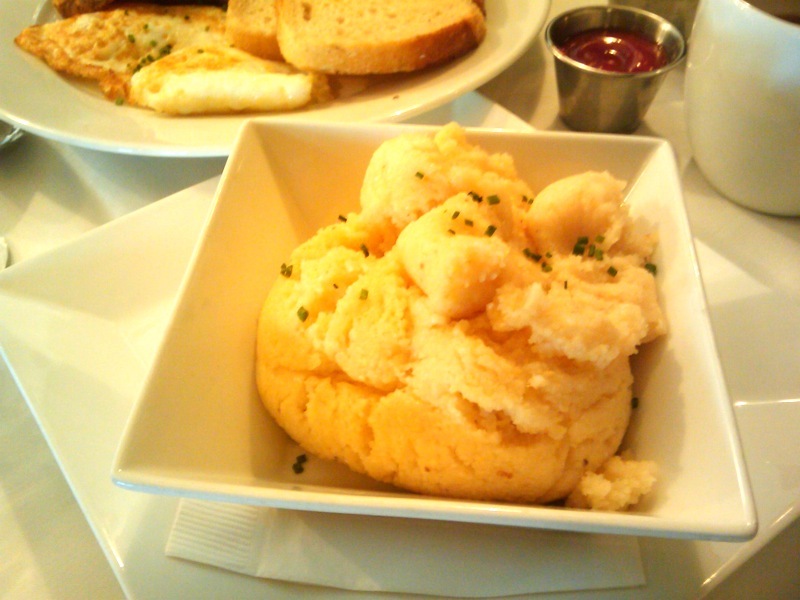 The grits were–ok, I’m from Georgia, so I’m a hard sell on grits. They were very tasty, but texture-wise, they were dry. I added a little cream to them and it helped, but couldn’t sustain. 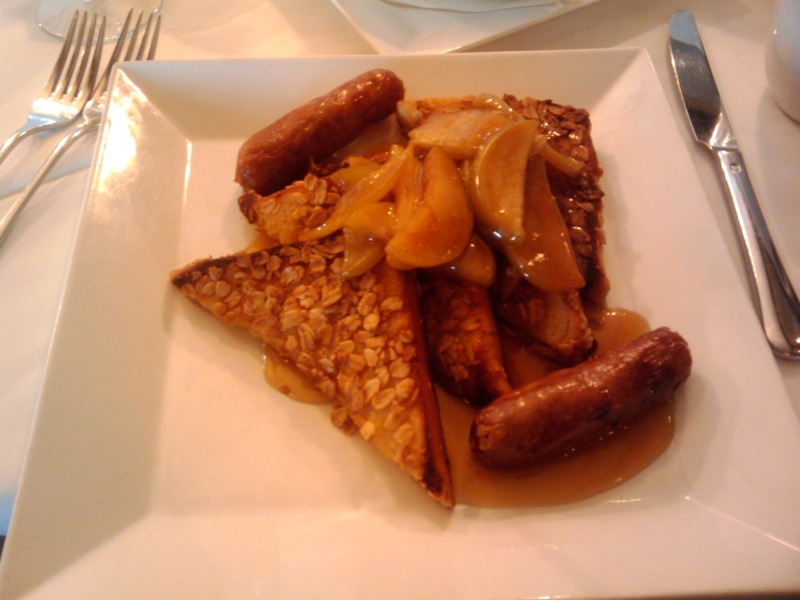 I then risked losing a hand and had a taste of James’ french toast, and it was delicious, nicely spiced with some sauteed granny smith apple slices and the maple sausage was nice! The service was fast and friendly, and coffee refills were so timely as to be transparent. They also have a jazz brunch, but in a change from other jazz brunches I’ve been to, they were very good and very subtle. The trio wasn’t amplified, so we were able to chat while they played and appreciate their talent. Given that it was Superbowl Sunday, I’m imagining the place was much less crowded than usual but that suits me fine. I don’t really have a ratings scale (yet) for restaurants, but if I were to suggest Chef Geoff’s Downtown brunch, it would be a good brunch for a date, visiting relatives, non-hungover pals, Macy’s Sunday shoppers or theater-goers. Dress is clearly casual to as dressy as you wanna be, I was in jeans and James in shorts. We didn’t need reservations, but since Chef Geoff’s uses OpenTable, I’d go ahead and let someone earn the points if everyone you’re eating with can be relatively on-time. * They also offer two burger options for $11 and big salads ranging from $12-17. Sides are $6 each and they bring the dessert menu afterwards. ** I don’t have a catchphrase either. Kudos on starting the brunch project! If you ever need a brunch partner, let me know! Oddly, I haven’t gone to brunch here in the OC… why is that…. Breakfast is by far my favourite meal of the day, and I am salivating at my desk looking at those photos.